Saint Nicholas is one of the most well-known and beloved Saints in the whole Christian world. He is celebrated in many countries and various traditions are associated with him. As with every Saint, in addition to basic information about his life, we also want the children to remember that we should try to be like Saint Nicholas, and that we can pray for him to intercede to Christ for us. For more details on teaching about the Saints, please visit our pages All About Saints and November Saints. We designed a number of activities to help accomplish the above goals. The children can work on a fact sheet about the Saint, or make a calendar card. For details please visit our page November Saints. 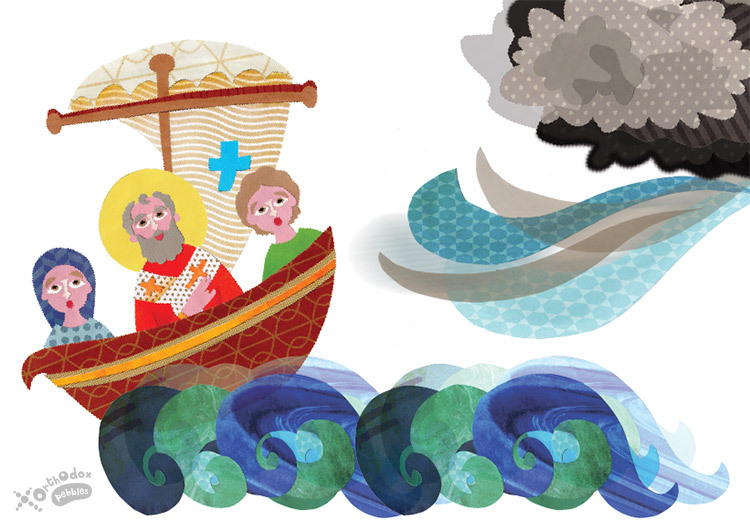 The paper puppets from our printable package can be printed, cut out, and used to act out the story of the miracle with the deliverance of the sea travelers. Detailed instructions can be found inside the package. Print and cut out the image. Glue onto the poster board. Decorate as desired to make it look like a real icon. 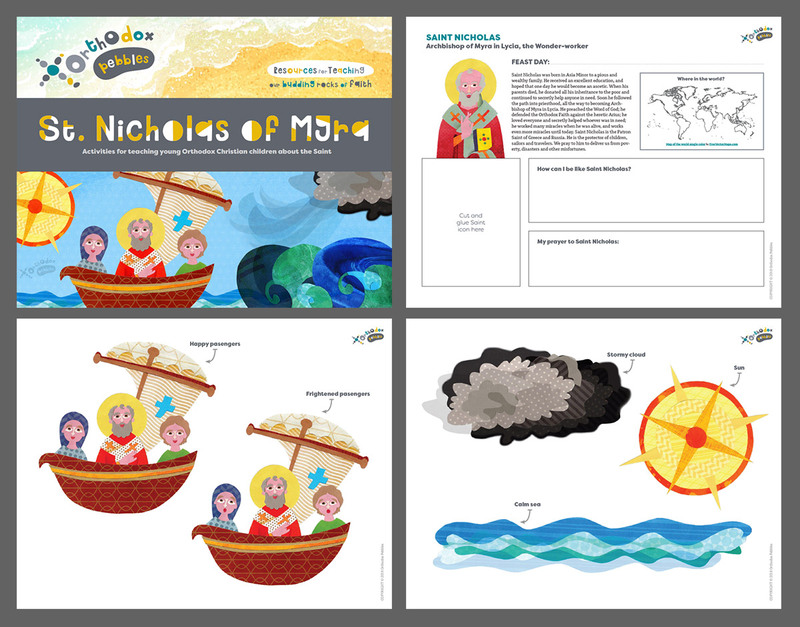 This is a craft to help the children remember Saint Nicholas as a Saint associated with the sea, as well as the miracle with the deliverance of the sea travelers. 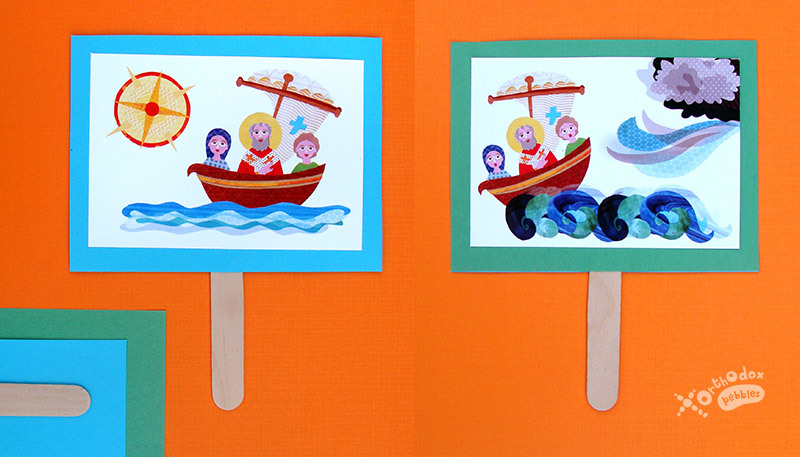 Using two images from our printables, the children make a double-sided scene. On one side, there is the sea storm, and on the other, the peaceful voyage after the storm has calmed down. Saint Nicholas is on the ship together with the passengers, praying for them and protecting them. Cut out the two scenes from the printable package. Glue each image on a piece of poster board, different color for each scene. Glue the two pieces of poster board together back-to-back, sandwiching a jumbo craft stick between them. The child can turn the image over to see how Saint Nicholas’ prayer was powerful enough to calm down the storm. – Fold the origami paper into a sailboat as shown in this online tutorial. 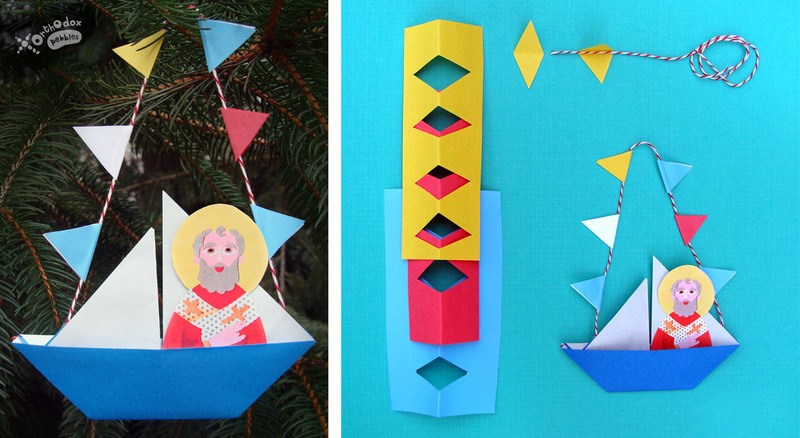 – Glue the Saint Nicholas image inside the sailboat as shown in the photo. – Tape a piece of thread or string on the sails so the sail boat can be hanged (see picture). The string should be long enough to accommodate a number of tiny flags. – To make the little triangular flags, fold a strip of colored paper in half and cut out small double triangles as shown. – Glue the two parts of the double triangles together, sandwiching the string inside the crease. The children can cut and glue the paper puppets mentioned above on a separate piece of paper to create a collage. Saint Nicholas was born around the year 275 AD in the city of Patara, Asia Minor (modern-day Turkey) and reposed around the year 360 AD. His parents were very pious Christians and wealthy, but they couldn’t have children. Like in so many Saints’ stories, they were praying constantly for a miracle and promised to dedicate their child to God. And then came baby Nicholas. Nicholas showed the signs of Divine Grace from his infancy. The story goes that during his baptism as an infant he stood for 3 whole hours without help from anyone – a sign that he worshiped the One True God, the Holy Trinity. Another story is that as an infant he refused to breastfeed on Wednesdays and Fridays (the assigned Orthodox fasting days), and only did so after his parents had concluded their evening prayers. Nicholas received an excellent education, while being raised in the Orthodox Faith. He was reading the Scriptures and praying constantly, hoping that one day he would become an ascetic (ασκητής, a monastic who lives in solitude, usually in the wilderness). During all his life, Saint Nicholas tried to follow the commandments of our Lord Jesus Christ. When his parents died, he donated all his inheritance to the poor and continued to secretly help all his fellow men in need. His uncle, the Archbishop Nicholas, saw in his young nephew the gifts of the Holy Spirit. He took young Nicholas under his protection and was responsible for his education in the doctrines of the Church. Soon Nicholas was ordained a Reader and a bit later he was elevated to the Priesthood. The story of Saint Nicholas’ elevation into bishop is remarkable. When bishop John of the town of Myra in Lycia (also in Asia Minor) reposed, the other bishops gathered and decided that the Grace of God would reveal to them the next bishop of Myra. One of them had a vision: an angel told him that the first person who would enter the church the next day, by the name of Nicholas, would be the next bishop of Myra. Nicholas was always the first to enter the church before dawn and that was what he did that following day. The other bishop, who had passed the night inside the church, saw Nicholas and asked for his name – then he understood that he was talking to the next bishop of Myra. During the last great persecution under Diocletian and Maximian (c. 305), Saint Nicholas was thrown into prison. With the accession of Constantine, he was freed and became very zealous in defending the Orthodox Faith. Among the Fathers gathered at Nicaea in 325 for the first Ecumenical Council, Nicholas was one of the leading champions of Orthodoxy against the heresy of Arius. Both as a priest and hierarch, Saint Nicholas proved a worthy shepherd of his flock. He preached the Word of God and explained the Truth of the Gospel; he loved everyone and helped whoever was in need in any way he could – and always in secret. Saint Nicholas worked many miracles when he was alive, and works even more miracles until today. Saint Nicholas is the Patron Saint of the countries of Greece and Russia, as well as of many of their cities and towns. He is the protector of children, sailors and travelers. We pray to him to deliver us from poverty, disasters and other misfortunes. Additionally, Saint Nicholas has promised to help those who pray for his parents, Athanasius and Nonna. The Saint’s association with boats and sailing is especially prominent in Greece, a country that has very strong bonds with the sea. He is the Patron Saint of the Greek Navy, and every Greek ship carries his icon. He is known for saving anyone in danger at sea. At Christmas time, especially in the islands, fishing boats honor him with decorations and lights. Traditionally, small wooden boats were decorated inside the homes at Christmas instead of trees, to thank Saint Nicholas for safely returning traveling loved ones home to celebrate the important feasts of the season; additionally, children made paper and wooden boats and went from home to home carrying them and singing carols, to receive small presents and treats. In many countries around the world, the primary gift giving day is Saint Nicholas’ feast day, not Christmas. Tradition goes that shoes or stockings are left for the Saint to fill during the night, and in the morning, children find small treats or presents inside of them. The well-known secular tradition of Santa Claus is also based on the Saint Nicholas story in many parts of the world – but not in Greece, where the Santa secular tradition is associated with Saint Basil. It should be noted that the Santa Claus custom is not acceptable in the Orthodox tradition, as it misinterprets the lives and downplays the importance of these two great Saints of the Church. One time the Saint was traveling to the Holy Land. The ship happened to meet a very strong hurricane. Everyone was terrified and sure that they would drown then and there. The Saint prayed fervently to God to save the ship and its passengers, and the storm calmed down. Another time, at another sea storm, one sailor knelt and prayed with all his heart, “Saint Nicholas, save me!”. Immediately the sailor appeared inside his house, among his family, safe and sound. An evil thought entered the father’s mind: to sell his daughters so he could get rid of his debt. Saint Nicholas learned of the father’s plan and secretly, one night, threw a sack full of gold coins into the father’s house. The sack was found and the father arranged a very good marriage for his first daughter. The same thing happened the following two nights with the other two daughters. Each time, the Saint provided a sack full of gold coins and so they were both well married. That way Saint Nicholas saved the whole family from spiritual destruction. On the last night, the father kept watch to find out who his benefactor was. When he discovered it was Saint Nicholas, he gratefully thanked him. The Saint asked the man to never reveal that it was he who had helped him – teaching us by his example the importance of humbleness. One time the city of Myra was suffering a terrible famine – for a very long time there were no crops in the fields and the people had run out of food, and were starving to death. Saint Nicholas prayed fervently with all his heart to God to deliver his people from this ordeal. There was a merchant ship carrying a cargo of corn sailing in the sea of Lycia; at one point, the ship’s captain saw a bishop in front of him; the bishop asked the captain to stop at the seaport of Myra and unload the cargo there; then he gave him 3 gold coins and disappeared. The captain did as he had been asked and the people of Myra praised God that through the prayers of Saint Nicholas He had delivered them from death. Icon by Julia Bridget Hayes, Ikonographics.net (Check out her wonderful iconography turorials at patreon.com/ikonographics.) Used with permission. Saint Nicholas is depicted as an older man, standing in his hierarchal vestments, holding the Gospel Book in the left hand – which is usually covered out of reverence – and giving a blessing with the right hand. He has a thin, almost emaciated face with large forehead, and short and curly white hair and beard; in some icons the top of his head is bald with a tuft of hair; his figure is austere (ascetical) with a serious facial expression. It is said that his serious expression recalls the story when, during the First Ecumenical Council in Nicaea, he stroke the false teacher Arius in the face. The Fathers punished Saint Nicholas by stripping him of his office as a bishop, but the Lord Himself and the Theotokos appeared in a vision to the Holy Fathers to intercede for Saint Nicholas, and so he was restored. Composition-wise, it is interesting to note that, in most icons, the Saint’s face from the top of the head to the lips is actually a circle, with the beard forming a smaller circle underneath. There is also a very well-known icon of the Saint, especially in Greece, which is named “Saint Nicholas saving those in peril at sea” or “Saint Nicholas, help of mariners”. In this icon, the Saint is shown during a sea storm, either inside a boat, saving the passengers, or kneeling on the water and pulling out a drowning man; sometimes he is shown doing both in the same icon. Ten miracle-working icons of Saint Nicholas at the blog “A reader’s guide to Orthodox icons”. Interesting collection of posts on Saint Nicholas icons, from a secular point of view, by a former museum researcher. Special thanks to the iconographer Julia Hayes for allowing us to use her icon in our web page and printables.